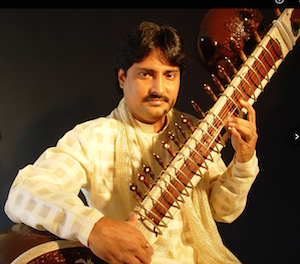 Indrajit Banerjee, is one of the leading sitarist of the Maihar Gharana. He was born into a musical family, which includes his guru, Pandit Kartick Kumar (Sitar), Pandit Barun Kumar Pal (Hamsa Veena) and Niladri Kumar (Sitar) amongst others. He is an A-grade artist of All India Radio and Television (AIR) and an approved artist of ICCR and has received many awards, including Gokul Nag Memorial Award, “Sur Mani”, Avinav Kala Samman, Parangotsava, Award for exceptional contribution by Sapna (Consulate General of India, Chicago). He has performed in many musical festivals in India and abroad (USA, Canada, Europe, Brazil, Middle East, Martinique Islands) and has collaborated with many Western musicians, such as Sting, Fareed Haque, Yaron Herman, Atash, Gypsy All Stars, Craig Pruess, Abbos Kosimov. 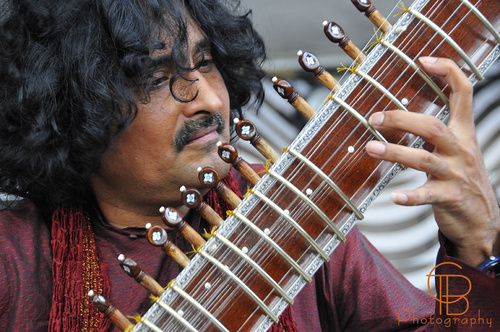 Sitarist Indrajit Banerjee is one of the leading exponents of the Maihar Gharana. He was born in a musical family, unique due to the large number of accomplished artists in Hindustani Classical Music. Some of these family members include his guru, Pandit Kartick Kumar (Sitar), Pandit Barun Kumar Pal (Hamsa Veena), Niladri Kumar (Sitar), Partho Das (Sitar), Aparna Roy (Surbahar). He got inspiration from his sitarist mother, Manju Banerjee, who was a disciple of late Nikhil Banerjee, and afterwards, Santosh Banerjee. Indrajit’s training began with his maternal grandfather, Bankim Kumar Pal, who was the disciple of Inayat Khan, and Birendra Kishore Roy Chowdhuri (Kochi Babu). He then took training under Pandit Manilal Nag of Bishnupur Gharana. Later on, he took intensive training from his uncle, Pandit Kartick Kumar, who is a senior disciple of Pandit Ravi Shankar. All of this training developed a strong foundation for Indrajit’s music, and creative individuality. Indrajit has a special touch on Sitar combined with technical virtuosity and sensitivity. He is an A grade artist of All India Radio and National Television, Panel Artist for Indian Council Of Cultural Relations, has served as Judge for A.I.R (Kolkata), and is a member of the American Federations of Musicians, and voting member of The Recording Academy (Grammies). He was awarded the Gokul Nag Memorial Medal in 1987 by Bangia Sangeet Parishad, (W. Bengal), “Sur Mani”in 1990 by Sur Sringal Samsad Bombay, Avinav Kala Samman in 1997 by Avinav Kala Parishad (Bhopal). Parangotsava-2007 (a festival held in Mysore, Karnataka) recognised him as Veteran (Pandit). 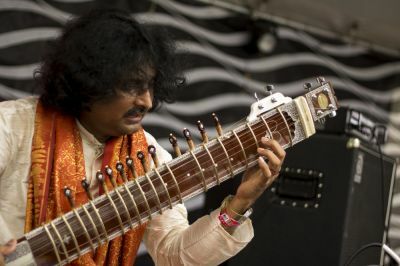 In 2014 awarded for exceptional contribution by (SAPNA) IL U.S.A.
Indrajit has been touring extensively toured in the U.K., Europe, Caribbean Islands, Lebanon, Hawaii, Alaska, Costa Rica, Brazil and Canada for the last 18 years as a solo sitar artist. He has also collaborated with several artists from the West, including STING (Channel V Awards), Yaron Herman, Abbos Kosimov, Goodman Theatre, Fareed Haque, Jeff Coffin, Roy Wooten, etc. 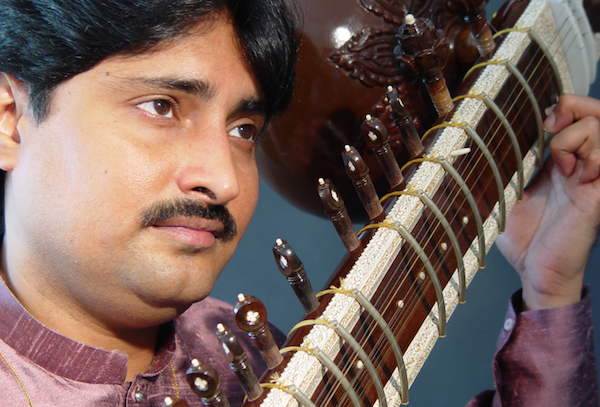 He has several solo sitar albums to his credit and also has been featured in many albums. 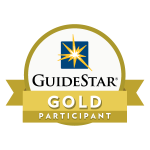 and he has National and International awards from India and the U.S.A. His lessons and instructional DVDs on Sitar are popular throughout the world. Indrajit is also a composer and has arranged music for several albums and award winning documentary films.